U.P // Year 1: And a merry purple to you. This day belongs to Melissamo. "Oh yay! I'm getting the LBD that's a Little Bit Different. " And a merry purple to you. 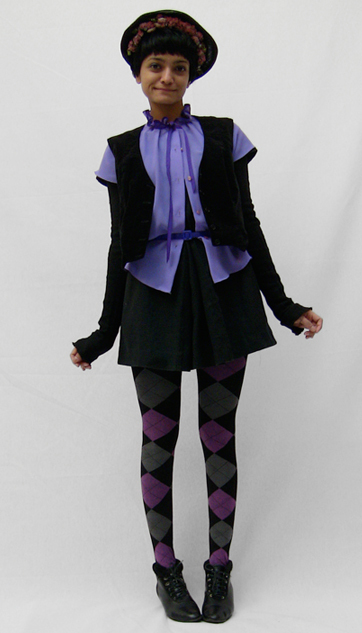 Vintage blouse from Treehouse, argyle tights from Sockdreams, suede vest, victorian bonnet and ankle boots from eBay. Wow! !smart indeed! !Love the purple with the gorgeous tights. Amazing hat! You are really doing it up for the end of the year. I'm loving this one (even the hat-which is a shocker to even me)! And the tights are brilliant! i love the blouse and the tights and the shoes...just an awesome outfit. Enjoying the ensemble of hues, shades, and tones of my very favorite colour in the world! Not a fan of the hat, but I'm loving everything else! Cuteness to the power of cute! Love the tights, as always! Reminds me of a schoolgirl uniform, but with a hugely amazing, colourful and creative twist. hmmm...well, i like the splash of purple. Christmas eve here, looking forward to your next festive outfits. Not sure about the hat but the purple splash is cool. When can we buy the dress?????????? And its unreal how much I'm looking forward to your Christmas outfit ! A very Merry Purple to you too! You look cute as a button with all the shades of blue. Love the argyle. You look very Victorian indeed. your outfits are just getting cooky! happy holidays! Good job with the colours!! j tagged this violet femme!